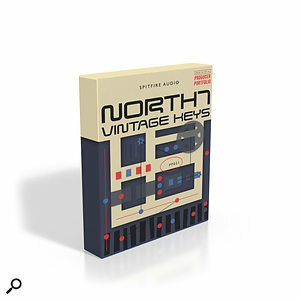 In an entertaining and supremely funky departure from their normal orchestral agenda, Spitfire Audio have released North 7 Vintage Keys, a collection of four classic instruments from the 1960s and 1970s. Spitfire’s Christian Henson admits, “I’m a recovering funkateer, so I’ve had a long love affair with these kinds of keyboard instruments.” Photos of Mr Henson in full Bootsy Collins regalia strutting his stuff on stage in a Harlem soul club have yet to emerge, but we await their arrival with bated breath. First up is a 73-note electric piano, which I assume is a Rhodes Mark 1 Stage Piano. Though the sound is warm and funky, the sparkling, bell-like attack I associate with Rhodes pianos is not much in evidence, but can be teased out a little with the on-board EQ. The instrument’s generally uniform response is marred by its G3 and A3 notes, which sound somewhat muted and lack sustain; however, such minor inconsistencies could be said to add to the piano’s character. Coming from a poppier place altogether is the Wurlitzer electric piano, the weapon of choice for many ’70s artists. While the dulcet, harp-like tinkling of the Wurli’s quiet dynamics are not explored, this sampled version nails the biting, barking delivery made famous by Supertramp, even providing accented staccato short notes so you can bang out those iconic eighth-note patterns. Back in the funk groove, the steely, twangy, percussive sound of the Clavinet has graced many a soul and R&B track, though superstition prevents me from naming the most obvious example. Spitfire have done a great job on this instrument, sampling multiple pick-up combinations and covering its entire tonal range from full-bodied, guitar-like sustains to thinner, more nasal timbres. The oldest instrument here is a 1962 rarity which, despite its specialised function and restricted range, is arguably the star of the show. I refer to the Rhodes Piano Bass: this cut-down keyboard delivers a great, thunky attack, but also sounds beautifully clean and fat when played quietly. You can use it as a conventional pop/rock bass, or dial in extra low EQ and pump out roof-rattling, sub-sonic EDM or dub bass lines. Each instrument was DI’d and also recorded through different amps, providing a choice of tonal colours. All good stuff, but the area where the collection really comes to life is in its processed patches, which utilise Spitfire’s bonkers eDNA engine to create a galaxy of fabulous effects. These include dreamy repeat echoes, stereo tremolo, phaser, auto-wah, rotary speaker, and (as we say in the trade) crunch and filth. The ‘best in show’ award goes to a magnificent pair of outrageously distorted, heavy bass patches, which in my view are worth the entry price alone. North 7 Vintage Keys (20.2GB installed) runs on both the free Kontakt Player and the full version of Kontakt.